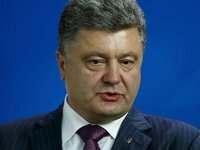 The audit of state-run Ukroboronprom Concern will be completed by the end of the current year, Ukrainian President Petro Poroshenko has said. The president pledged he would do his best for the audit to start as soon as possible. According to him, the government and the National Security and Defense Council of Ukraine should begin the procedure for selecting an auditor. "It should be a well-respected, trusted international company," he said. Poroshenko also said he would like that one of the Big Four [Deloitte, Ernst & Young (EY), KPMG, PricewaterhouseCoopers (PwC)] or Big Five [Big Four and Andersen] to audit Ukroboronprom. As was reported, after results of a probe by Bihus.Info journalists into procurement embezzlement in the defense industry were made public late in February, Poroshenko announced Ukraine would initiate a comprehensive international audit of Ukroboronprom. On March 6, the National Security and Defense Council of Ukraine (NSDC) ordered an audit of the activities of Ukroboronprom state concern and its member companies with the involvement of foreign experts. The council also recommended that the Prosecutor General's Office of Ukraine, the Security Service of Ukraine, the National Anti-Corruption Bureau and the State Investigation Bureau "carry out an inspection and give a legal assessment of violations in the field of defense procurement outlined in mass media and inform the public about the results."